Many trucking company presidents learned their business lessons from the “school of hard knocks,” but James Helwig can say he experienced it literally. Before trying his hand at trucking, he was a boxer and a bouncer – two occupations where he learned what not to do in business. “I go the other way,” Helwig stated. Once you read his story, you’ll understand why. James Helwig was a Golden Gloves boxer as a teenager in the mid-1960s, before playing linebacker at Texas Christian University for three years. After college, he resumed boxing and became a professional in 1971. Helwig quickly won the Texas Heavyweight Championship belt, and would soon be ranked in the world standings, earning him a two-round exhibition fight with undefeated WBC and WBA Heavyweight Champion Joe Frazier at the Houston Astrodome on July 15, 1971. It would be Frazier’s first fight since defending his title in a 15-round victory over Muhammad Ali in New York earlier that year. When asked about that fight, James Helwig stated, “I was nervous for a few days, and I remember them bringing us to the boxing ring in golf carts. Cleveland Williams fought Frazier for two rounds, and then I came in.” Helwig fared well against Frazier, landed several big punches and avoided getting knocked down by the champ. “I could take a punch,” Helwig said. Thus, Helwig started a stint as a lumper, and because he was in great shape, he could unload a truck in 2-3 hours. During his free time, he took the opportunity to talk to truckers about their daily activities, fuel costs, and other expenses. After many discussions, he thought he could be successful as an owner operator. James Helwig took his chauffeur’s license test in a dually pickup and admits he did not even know how to shift gears in a big rig, but he was determined to make a career in trucking. At the time, a CDL was not yet required and there were fewer restrictions. In fact, trucking in the state of Texas was not regulated by Interstate Commerce Commission, but the railroad commission instead. However, several teamster operations held the interstate rights to non-exempt commodities, so there were limited types of authority available for owner operators. One category of freight that qualified as Exempt Commodities was produce, so Helwig started as a one-truck operation hauling fruits and vegetables from the Texas Valley, a fertile agricultural area in the southern portion of the state. Helwig said he received a “rude awakening” once out on the road and laughs as he recalls some of the early challenges to his enterprise. One of first loads he hauled was to Boston, where he was stuck in traffic going up a steep bridge. Worried about missing a gear and creating havoc behind him, James almost burned up his transmission and brakes on the incline. His next trip was to the South Bronx in New York City where he had to deliver to Hunt’s Point, one of the largest food distribution centers in the world. The facility is known for its narrow backing and docking lanes, and Helwig had to pay an “old hand” a few dollars to back up his trailer for him. “Trial and error” improved Helwig’s driving dexterity, and he also honed his business skills for a few months before getting off the road just before deregulation took effect in the early 1980s. He chose Rockwall, Texas as the location to open an operation that hauled produce to the East Coast and trip lease back to the Lone Star state. They started hauling for shippers like Xcel Meats (now Cargill Foods) and slowly grew the business. After purchasing 15 trucks, he incorporated James Helwig & Son in 1984. 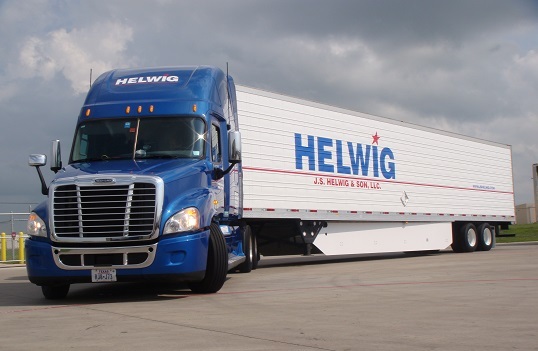 Over the next two decades, Helwig built the fleet up 215 trucks and would sell the company in 2005. However, he called it “the worst mistake of my life” and soon had the desire to get back into the trucking business. After a brief hiatus, James formed J.S. Helwig & Son, LLC as a 48-state common and contract carrier, serving customers of temperature controlled and time sensitive traffic. In just a few years, Helwig increased his equipment to 165 trucks and is steadily progressing his customer base. James now operates approximately 300 power units and 500 refrigerated trailers, leading one of the best temperature controlled trucking companies in the United States. Starting over posed a new set of challenges, but Helwig has learned an organization dedicated to customer service and quality will be successful. With pending regulations, Helwig also knew his new entity needed to focus on efficiency and safety. He is proud of the fact that his fleet has good CSA scores and has never failed a safety audit. James Helwig operates under a simple philosophy that serves him as well at the delivery docks as it did in the boxing ring: “don’t miss.” He still makes sales calls and thinks service is going to mean something again in this new ‘Hours Of Service’ era. His operation utilizes solo and team drivers plus owner operators, which offers flexibility to adjust to their customers’ needs. This approach has resulted in a 99.8% on-time delivery record and numerous awards. These achievements are also due to utilizing modern equipment and the most up-to-date technology. Driver pay is another area where James Helwig wants to be a leader. According to the National Survey of Driver Wages, the company ranks among the highest in their category. 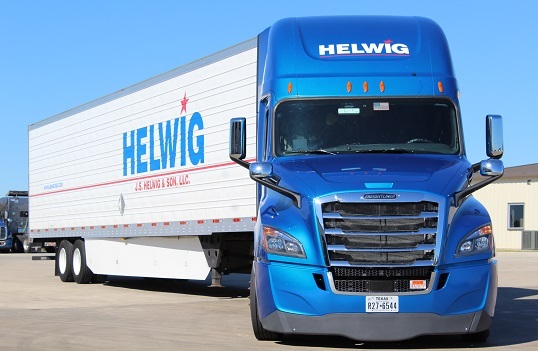 In fact, Helwig’s starting pay is higher than maximum pay at many fleets. “I put my money where my mouth is,” James said. Back in the day, it was just the opposite for Helwig, who was putting his mouth – and the rest of his face – in harm’s way to earn a paycheck. “One thing I learned as a boxer and a bouncer is a fair fight is a fair fight, and that a man should not fight a kid,” Helwig said. He applied that lesson to his personal life as well. When his first trucking company was started, he could envision a succession plan with his son one day taking over the operation. However, his son, Jamie, would have other plans. At 15, James Helwig had already had his first Golden Gloves fight. At 15, Jamie was completing half-Ironman triathlons and on the fast-track academically for college. Jamie would go on to graduate from the Wharton School of Business with a 3.8 GPA. 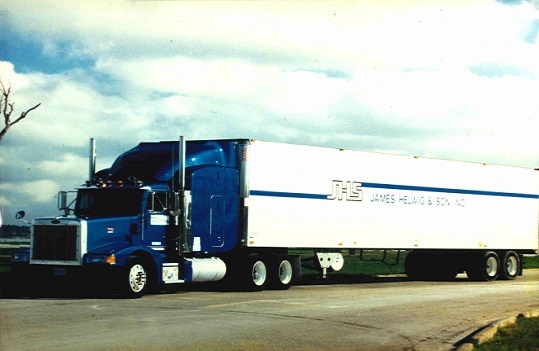 When James formed a trucking company the second time, he kept the “& Son” designation. “It’s really a tribute to him. He’s everything I wanted to be,” James would say about his son. 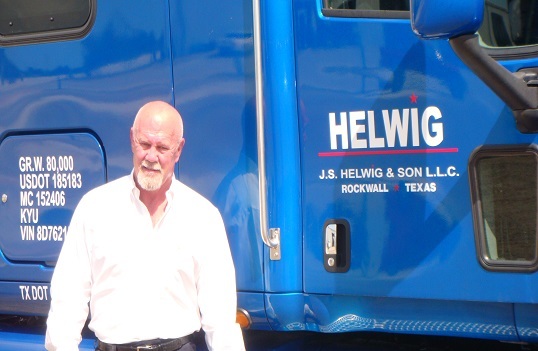 Helwig is equally passionate about the company’s professional drivers, who he treats as extended family. In fact, the best driver benefit at J.S Helwig & Son may be access. “I never refuse a driver call,” says Helwig, who currently serves as owner, president, & CEO of the company. Maintaining the relaxed environment he started from the beginning, Helwig continues to build the relationships with his office employees and drivers. Gary Cooley, a regional driver who has been with Helwig for almost two years, appreciates being able to interact with the owner. “When James says he has an open door policy, he means it. I’ve never been able to say that about anywhere else I have worked,” Cooley stated. J.S. Helwig & Son currently has driving opportunities available for company drivers, as well as select owner operators. If you want to work for a man who relates well to drivers and understands the unique challenges the road presents, please contact our recruiting team today at (844) 299-2824.